Cliff Palace is the largest Ancestral Puebloan cliff dwelling in Mesa Verde National Park. With 150 rooms it was the home for over 100 people. Other than being viewed from a couple of overlooks, Cliff Palace can only be seen through a guided tour. The times and frequency of the tours vary throughout the year so it is best to visit the Mesa Verde website and plan your visit ahead of time. Since the size of the tours are limited you might also consider buying tickets in advance for the tours you are interested in. Other popular tours at Mesa Verde include the Balcony House and the Long House. The Spruce Tree House and the Step House are other cliff dwellings that you can visit without purchasing a ticket or participating in a guided tour. Tour tickets are obtained from the Far View Visitor Center at Mesa Verde and also from the Visitor Center in Cortez, Colorado. Tickets can be purchased up to 2 days in advance. Once you have your tour tickets in hand follow your map to the Cliff Palace parking area. Keep in mind that if you are driving from Cortez that the Far View Visitor Center is about 14 miles inside of the park once you turn off of Highway 160. It is about another 9-10 miles from there to Cliff Palace. The speed limits within the park never exceed 45 MPH but if you plan on averaging 25-30 MPH you will come out about right. Along the path to the overlook there is a little shack where you can pickup a trail guide and bottled water. Since trail guides aren't always available, though, you may want to grab one while you are at the Visitor Center. They can be purchased for only 50 cents and the money goes toward a scholarship fund. It would probably be wise not to depend on water being available either. Water is the only beverage that is allowed around any of the ruins and no food or snacks are allowed either. The worry is that crumbs and such will attract rodents that may then undermine the ruins. There is a spectacular view of the Cliff Palace ruins from the overlook. Another overlook with a good view, all be it a little further away, is from the Mesa Top loop road. There is no charge for viewing the ruins from the overlooks but a locked gate keeps you from going any further and the Park Ranges are the only ones with keys. Visitors assemble for the tour at the Cliff Palace Overlook where the ranger welcomes them, explains the rules, gives a little safety talk and collects the tickets. Sometimes if they aren't real busy and you arrive early the ranger may let you join their tour even if your ticket is for a later one. People on this particular tour weren't allowed to do that but at the Balcony House and the Long House they were. It seems to be up to the Park Rangers discretion. The cliff dwellings are about 150 feet lower in elevation than the parking area. A series of steps, stairs and ladders are used to complete the transition. The slideshow at the end of this post should include at least one photo of each of the conveyances. As with other locations within Mesa Verde the atmosphere is very peaceful and contemplative. The ladders are wide with well spaced rungs, secured to the rock for stability, and the top runners extend high enough to assist the climbers transition from the ladder back onto the pathway. The tour stops at several points along the way so the guide can share the knowledge that has been gleaned from all the study and research that has been done not only on the cliff dwellings themselves but also from studies and interviews with the descendants of the Ancestral Puebloans that are still among us today. It is also good to know that at each of the sites that you can visit in Mesa Verde they don't simply continue to recite the same information that you may have already heard at one of the other sites. At each site you can learn something new and different. The information really does go a long way to enrich the overall experience. The tour groups can get quite large during the summer months and holidays but the first tour of the day which is usually 9 AM can be a fraction of the size of later tours. It's quite thought provoking to imagine living in such a place. I will leave it to the park rangers that lead the tours to explain what they have learned from studying these ruins and others and concentrate my efforts on showing you what to expect. As one tour has made its way to the far end of the dwellings and is preparing to exit the next tour is beginning to enter. The tour at Cliff Palace completes a loop that begins at the overlook that is accessed at one end of the parking area and exits up a series of well built hewn steps and ladders at the other end of the parking area. The ladders at the exit are longer than at the entrance but just as well built. There were several folks on this tour that had bad knees, and one with a bum shoulder, that managed just fine with a little assistance from their friends. As far as small children go you should consult with a ranger at the Visitor Center. It appears that they should either be able to climb the ladders by themselves or be put in a pack-type baby carrier that would leave your hands and arms free to manage the ladders. The best plan for thoroughly enjoying Mesa Verde is to come early in the day to beat the crowds. 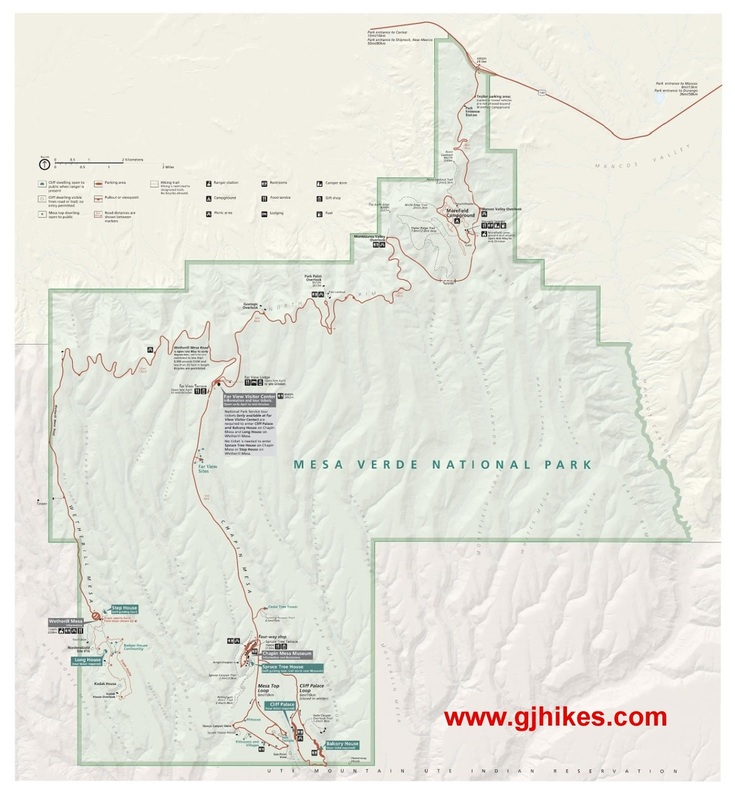 There are around 600 cliff dwellings and over 5,000 known archaeological sites within Mesa Verde National Park. While only a fraction of them are open to the public it takes a little time to get from one place to another. The rangers at the Visitor Center are very helpful with planning how long to allow between tours. With 1 full day you can enjoy a memorable number of places, 2 full days will get you to the major locations, and 3 full days will be even better giving you some time to not only go on tours but to visit the museums and gift shops and hike some of the splendid trails like Petroglyph Point and Spruce Canyon. If you would like to see it for yourself then all you have to do is 'Take a hike'.